On April 12, 1961, Gagarin became the first human to travel into space in Vostok 3KA-2 (Vostok 1). His call sign in this flight was Cedar . According to international media, from orbit Gagarin made the comment, "I don't see any god up here." 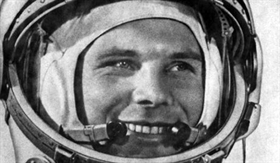 There are however no such words in the full verbatim record of Gagarin's conversations with the Earth during the spaceflight  While in orbit Gagarin was promoted "in the field" from the lowly rank of Senior Lieutenant to Major - and this was the rank at which TASS announced him in its triumphant statement during the flight. At the time the Soviet authorities thought it was more likely he would perish during his descent than survive. Returning to Earth, Gagarin became very famous. Nikita Khrushchev rushed to his side and Gagarin issued a statement praising the Communist Party of the Soviet Union as the "organiser of all our victories". He then toured the world. Khrushchev saw Gagarin's achievement as a vindication of his policy of strengthening the Soviet Union's missile forces at the expense of conventional arms. This policy antagonised the Soviet military establishment and contributed to Khrushchev's eventual downfall.